She is the queen of flowers and the classic Valentine’s Day gift: the Rose. In My Free Zoo, you can now place roses in all sorts of colors and shapes. Yellow roses in pots or pink rose trees, even roses winding around pretty white garden fences – roses are everywhere! If you’re already looking forward to spring, the Valentine’s Day decoration event in My Free Zoo has something for you, too: Crocus flowers and delicate snowdrops can now grace your virtual zoo. There are also plenty of other Valentine’s decorations for you to set up: rose vendors and chocolate shops for happy couples, and a beautiful romantic pavilion. The special Valentine’s shop in My Free Zoo also has a dancing couple, a singing Cupid, romantic garden torches, and Cupid fountains for you. These wonderful decorations are sure to make your zoo a true love nest. And how about the end of the campaign – what prizes await there? 500 bouquets will grant you a Hyacinth Macaw. Level 2 – at 2000 bouquets or more – grants a White Stork. 10,000 bouquets get you a second Hyacinth Macaw, and level 4 (at 25,000 bouquets) will reward you with a Gold Booster. The final level gives you another White Stork. All these rewards are additive. That means if you reach level 5, you will get all of the aforementioned rewards. The Valentine’s Campaign in My Free Zoo ends on February 18th. 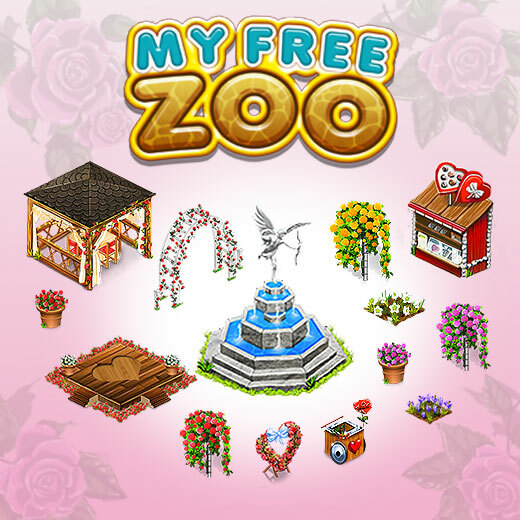 Romantic Spring Feeling with the Valentine’s Decoration Event in My Free Zoo!